Gauges are essentially the sole interface between the measured object and the measured value and it is safe to say that this value lies at the beginning of all quality management efforts. If, for whatever reason, the value is not measured correctly, all subsequent QM processes such as incoming/outgoing goods inspections, SPC, or quality planning will be in vain. As the reliability of information is determined right at the point of its initial collection, perfectly functioning gauges are essential for successful quality assurance. Gauge management is applied in order to ensure that the employed gauges are always correctly calibrated and in sound working order. It furthermore organises the acquisition, application, and maintenance of all gauges. It comes as no surprise that the seemingly logical necessity of a gauge management system in the production environment is also a key requirement of many standards and an aspect of great legal importance with regard to product liability. Chapter 7.1.5 of ISO 9001, for instance, requires that a process is implemented which ensures the suitability and reliability of all gauges that are employed in a company. From a legal point of view, manufacturers cannot provide full evidence in case of product malfunction that everything was done to prevent said malfunction if they cannot prove that all gauges were correctly maintained and calibrated. In contrast to manually maintaining your gauge-related documents, the application of a software solution like CAQ AG’s PMM.Net allows you to perform gauge management as an active process. This applies regardless of whether the module is used as stand-alone solution or as part of a whole CAQ-system. The software facilitates the planning and monitoring of both freely determined and manufacturer-specific maintenance intervals. It doesn’t matter whether you wish to monitor 10, 1000 or 100,000 gauges: all relevant information such as type of device, ID-number, location, specification, current user, calibration interval, or calibration results is consistently maintained in the system for each individual gauge. The integrated assistants support you throughout the standard-compliant application of VDI/VDE inspection plans or gauge capability monitoring in accordance with MSA 1-6 and VDA 5. These integrated tools greatly simplify inspection planning and gauge inspections and thereby eliminate the error-potential of manual gauge management. As many companies have their gauge calibrations performed by external laboratories, the software also supports the VDI/VDE 2623 standard. This standard facilitates the direct exchange of gauge-related information via the CDE-format (Calibration Data Exchange). PMM.Net assists you in the fulfilment of the aforementioned standards and legal obligations by facilitating consistent traceability and recording the full history of each gauge. All gauge-related data is contained in the software and available at the push of a button. Said data naturally includes all important documents such as instruction manuals or maintenance certificates. In order to consistently keep an eye on the gauges themselves, the software contains functions such as gauge-monitoring via barcode, QR, and RFID. PMM.Net can also be integrated in existing physical gauge management facilities. Many gauges consist of several individual components and thus exhibit a special challenge for the organization and execution of calibrations and maintenance jobs. PMM.Net therefore allows you to consolidate any number of a gauge’s components in one group. This allows you to synchronize inspection dates and ensure that the entire device is calibrated in one go – thereby significantly reducing the planning effort and power-off hours caused by otherwise varying calibration dates. A fully linked CAQ-system like CAQ.Net® provides measures that go way beyond the mere adherence to standards and protection against legal matters. Apart from providing real-time monitoring and documentation of the state of a gauge as well as its location of use, and calibration status, the gauge management module PMM.Net ensures that only gauges which are available and in sound working order are implemented in measuring processes – thus eliminating the possibility that faulty or unsuitable gauges are used. 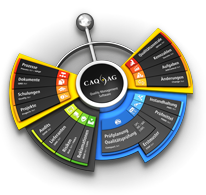 All of this creates powerful synergies throughout the entire quality management of a company and highlights gauge management’s status as integral part of the comprehensive PDCA-cycle.